You are going to think I am crazy and that's fine. Normally, I probably wouldn't make a big deal out of this kind of card but there is such a ridiculous story that goes with it. I have been trying to get this card for around 2 years give or take. I won this card before on eBay but I never received it because the man selling it gave it to his wife, who put it on the boat to mail it and the boat got lost, his wife was "Tubby", and so on and so on. The story made no sense then, it makes no sense now. I waited for weeks to get the card, he lived on mainland United States, and had zero reasons to be sending me a card on a "boat", be it a mailing boat, a sail boat, or a Fischer Price toy boat. So at that point I was frustrated and annoyed, mostly because the card was so cheap at the time but I ended up getting my money back for that blunder. I have been waiting and waiting, and trying to get this card at a decent price and it never happened until now. It was a decent price considering his stats for the season. I plan on laying low until the winter rolls around and no one cares about baseball but me to search for any other missing pieces. My 2005 Bowman Sterling GU Jersey Autograph. I feel a sense of accomplishment now that I finally have this card after years of waiting, and one very, very odd reason as to why I don't have it. Welcome Adam, you have been a long time coming. Would it be too much to ask to try and get the refractor of this card? Ha. That's a cool card. I should get one for my rookie collection. that's a GU Jersey auto? It looks like a GU bat auto to me unless something is funky with the jersey swatch. thats the problem with getting a great price at auction and not getting the item. Even if you get reimbursed, it is really hard to justify paying a higher price when you see the item again. 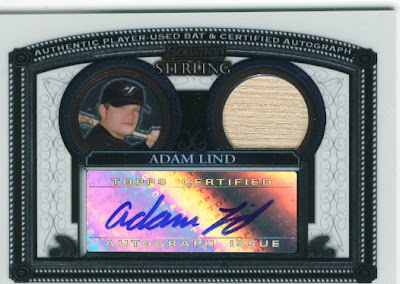 glad you were able to wait it out and the card came up again - especially considering the great yr Lind had. congrats on that. Some Ebay sellers like to play games when their auction sell for less than they expected and they had no reserve. Suddenly a weird boat story comes a float. I think that card found a home that will appreciate it for years. Let us gaze upon the wonder of Adam's rookie card.....now wipe the drool from your chin. I have several of these and I love em! Go for the refractor!